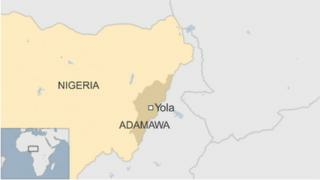 More than 30 people have been killed in a suicide attack at a market in the northern Nigerian city of Yola, officials say. The blast, heard across the city, struck a busy vegetable market where traders were closing up on Tuesday. Nigerian President Muhammadu Buhari visited Yola on Saturday, declaring that the Islamist militant movement Boko Haram was close to defeat. Following the attack, Facebook activated its safety check feature. This is the first time the feature has been activated in Nigeria, and follows criticism that it was done after the Paris attacks but not elsewhere. Yola has twice been hit by deadly bomb attacks this year. The city lies in the north-eastern state of Adamawa, one of the worst hit by the Boko Haram insurgency. More than 80 people have been taken to hospital, some with serious injuries, emergency workers say.